Since 2018 the “Car Aftermarket Report – Bosnia Herzegovina” is now available as a part of AFTER SALES ACCESS online database. Instead of PDF report issued on annual basis, Wolk After Sales Experts provide data updated as soon as it becomes available. No more data gathering from plenty of different sources - we did it for you and present all information in a structured and comparable way - all out of one hand. Access to our database from anywhere and at any time. All data is prepared visually and changes dynamically with every selection made. The underlying Business Intelligence architecture enables intuitive handling and enables the user to immediately analyze the available data in depth. All data can be exported in the usual formats such as Excel CSV, JPG and PDF. Individual evaluations or entire dashboards can simply be sent from the system by e-mail as PDF attachments and can even be pre-scheduled at fixed times. The responsive display of the database adapts to any size. From desktop to tablet to mobile phone. ORDER / PAYMENT: Order online and pay with credit card. Order online and pay on invoice via bank transfer. All prices are NET prices. German customers have to pay 19% value-added taxes. The sale to private individuals is not possible. If we have caught your interest in several countries / individual modules, please contact our Head of Marketing and Sales Sebastian Heitfeld (+492204842030 / sebastian.heitfeld@wolk-aftersales.de) to receive an individual offer. Company profiles of nearly all companies distributing automotive components in Bosnia Herzegovina. With just a few mouse clicks, for example, you can create a Top 20 list of the largest distributors for automotive parts. Which workshops are provided through the market by the distributors? Overview of the trade and buying groups active in Bosnia Herzegovina and their members. The database is immediately updated according to the latest market events such as a merger or acquisition. In this way, you always keep an eye on the retail sales of the trade and buying groups. Aftermarket volume by general 10 product groups and IAM/OES split. The volume is expressed in the form of end-user prices excluding VAT and salary. Number of workshops by type of workshop in Bosnia Herzegovina. Overview of all workshop concepts with the number of connected workshops and details of which dealers supply these concepts. Development of the vehicle population for cars, trucks and buses. Car park divided by brand (Powered by TecAlliance). 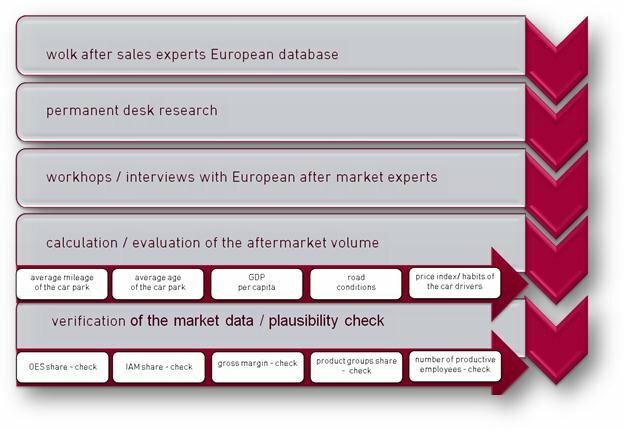 The methodology of the ”Car Aftermarket Europe Report” was used to create After Sales ACCESS. The experience in the European after sales business we gained by the creation of the Car Aftermarket in Europe reports 2009, 2010, 2012, 2014 and 2017.In addition we traveled in the countries for Face to Face meetings with automotive after sales experts. We visited for example the representatives of the parts industry, the parts distributors, the national automotive associations, the buying groups, the garage concepts and other opinion leaders in the national markets. Our goal was to discuss the current aftermarket situation, make a comparison with the data from the previous report, analyze data already monitored, and estimate the tendency in the aftermarket. Subsequently, the data thus collected was compacted, evaluated and compared with the wolk after sales experts database to determine the market size per country. The market volumes for 10 product groups and for the whole market cumulative were calculated by means of the internal tools using the well-researched data from Germany and provided them with a country-specific coefficient. We calculated this coefficient for each country. For the calculation we took into account the following national influence factors: mileage per year, GDP per capita, road conditions, age of vehicle fleet and the habits of the car drivers as well as the parts price index. Depending on the size of the influence factors we weighted them accordingly. Finally, to eliminate the calculation error, we checked and validated by several methods the data thus obtained with data we collected by research and expert interviews. As a first step, we checked the after sales turnover data of the authorized car dealers and repairers adjusted by the labour costs (only sold material) by the OES market share of the total volume. In the second step we compared the calculated IAM share of total market volume with the sales data of repairers, retailers and IAM wholesale distributors adjusted by the gross margin. In the next step, we checked the turnover data of the IAM specialists on the repair level (e.g. tires, body and paint etc.) adjusted by the labour costs and compared these with the market volume of the specific product group (market volume for tires, body parts, auto glass etc.). The result should correspond to the market share of the specific distribution channel (e.g. share of tires sold by tire specialists). Finally, based on the proportion of labour costs, we calculated the average number of productive employees and compared these with the market data obtained by the F2F interviews. The comprehensive European Car Aftermarket Study by Wolk After Sales Experts gives an insight about the Who-is-Who of the most important players in the Automotive After Sales Market as well about the size of the parts and accessory market based on data and research. The standardized country profiles enable fast finding of country as well automotive related KPIs. A must have for European or global headquarters acting in our industry and a good introduction for newcomers. Whether in marketing or sales - in form of a database or as an always available reference the report gives us an insight into the markets and supported us with many important structural data in strategic planning and business development.